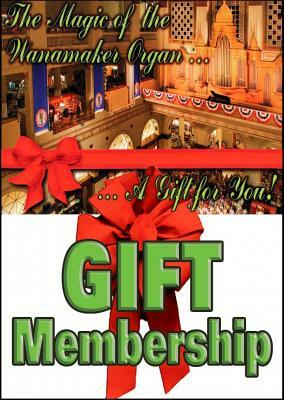 Give a Friends' gift membership to a friend and he or she will receive a special gift card in your name. Four issues of our information-packed quarterly newsletter The Stentor will also arrive in the mailbox throughout the year to remind your friend of your thoughtfulness. Gift subs are available for an introductory price of just $25/year. Simply fill out the form with your information in the ORDER BY column and the recipient's information in the DELIVER TO column and we will take care of the rest. Friends members receive news of special concerts and fund-raiser entertainments, special historical articles on the Wanamaker Organ's heritage, plus concert reviews the latest in-depth coverage of the ongoing restoration.